A Pit Pass will give you access into the NASCAR garages Friday & Saturday & the Pit Road area before the races on Saturday. *One pass is valid for the entire weekend. Includes one suite admission, catering/snacks throughout the day, beverage service all-inclusive soda, water, beer & wine, a parking spot in the S1 lot & one pit pass. Includes one Saturday ticket with seating in the Main Grandstand under the overhang. Includes one Saturday ticket with seating in either the Main or Concord Grandstands. Seating in the Main Grandstand will not be under the overhang. 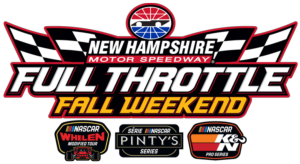 Includes one Saturday ticket with seating in the Main or Concord Grandstands. *Kids are defined as being 12 years & under. Includes one Friday ticket with seating in either the Main or Concord Grandstands. Includes one Friday ticket with seating in the Main or Concord Grandstands.